"Nikolic insisted that it was the only ‘lie’ he told. His evidence was a truthful description of what he saw and experienced, including his own role in the events in Srebrenica. Nikolic was, as he claimed, deeply remorseful for it. ‘It’s not only that I am sorry, this is the cause of my suffering’, Nikolic said with tears in his eyes, apologizing to all the victims. 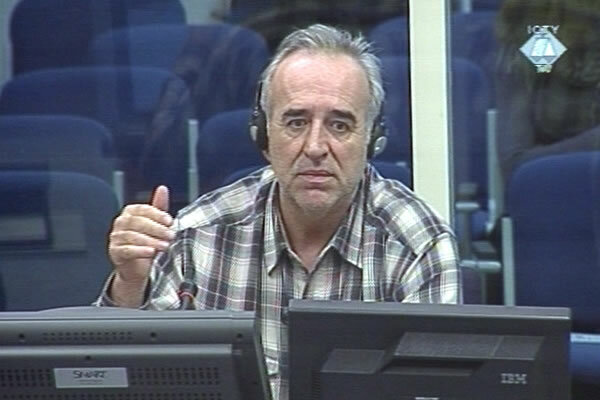 Nikolic – a former teacher – apologized in particular to ‘my students who were killed in the crimes in Srebrenica’. Although his role was not crucial, as Nikolic said, because he ‘neither ordered nor planned’ the crimes, Nikolic felt responsible because he ‘obeyed orders’ that resulted in a large number of victims and caused a great deal of suffering to the people in the enclave. ‘I am aware of my guilt and I have repented for it’, Nikolic said. Replying to the prosecutor, Nikolic confirmed that he was the first VRS officer to plead guilty for the crimes in Srebrenica." "The zone was put under increasing pressure by blocking the convoys that brought in supplies to the people of Srebrenica and to UNPROFOR and other international organizations whose representatives were stationed in the enclave after it was declared a protected area in 1993, Nikolic said... The prosecutor showed the witness a series of documents in which the VRS [Serb Army] planned restrictive measures towards the enclave. One of the documents is an order by the VRS Drina Corps commander Milenko Zivanovic from July 1994. In addition to blocking the convoys, his soldiers are ordered to restrict movement on the Srebrenica-Zepa, Srebrenica-Kladanj and Srebrenica-Tuzla roads and to train and equip snipers in the Drina Corps units in that area. Nikolic confirmed that he had obeyed this order. As the Srebrenica operation neared, the VRS measures against the enclave grew even more restrictive: the final goal was ‘the elimination of the enclave’." "...all the Balijas [derogatory word for Muslims] should be killed"
"... After the fall of Srebrenica, on 11 July 1995, the people from the enclave headed towards Potocari in a huge column of refugees. Nikolic was ordered to provide security for the meetings in the Fontana Hotel in Bratunac, where General Mladic met with the UN Dutch Battalion commander, Colonel Karremans. That same evening and on the next day, Mladic met with the representatives of the refugees from Srebrenica. Before the third meeting, on 12 July 1995, Nikolic talked with the two officers from the Drina Corps who were his superiors, Colonel Svetozar Kosoric, in charge of intelligence, and security officer Vujadin Popovic. Popovic told Nikolic that all the men in Potocari, close to 2,000 of them according to his estimate, would be arrested and detained. When he was asked what would happen to them then, Popovic replied, ‘all the Balijas [derogatory word for Muslims] should be killed’." BOSNIAN GENOCIDE, WHAT NOT TO FORGET?